Orange juice flavours added back to orange juice. Origin of natural orange flavours. What is meant by the folding of oils. What an add-back system consists of. Useful terms used in discussing pulp. The characteristics of floating pulp. How floating pulp is measured. Components added back to juice at fruit processors, blending houses and juice packers. To obtain the desired flavour characteristics in reconstituted orange juice, volatile flavour components recovered from concentrate production are added back to orange juice. This can be done at several steps of its production. Peel oil, essence oil and essence aroma are the three most important flavour fractions derived from the orange fruit. Often the raw flavour materials are standardized to provide uniform and consistent flavour composition, and to improve the stability of flavour components. Orange oils contain only small amounts of the desired flavouring compounds and are often folded. This means that the bulk of the oils’ hydrocarbon content is reduced by either distillation or solvent extraction, thereby increasing the concentration of the desired compounds. Flavour systems are developed to give particular juice products desired flavour characteristics. A blend of terpeneless oils enhanced with essence aroma and top-note compounds such as acetaldehyde and ethyl butyrate is an example of a complex flavour system. Pulp is considered an important byproduct for adding to juice because many consumers think it gives juice a fresher appearance and a better mouthfeel. Cell length, which is affected by the juice extraction method used, is an important property of pulp. Juice processors may add peel oil to juice concentrate prior to storage. Blending houses, which mix concentrates of different origin, may also add volatile flavours and pulp to produce concentrates with distinct characteristics. Juice packers can add a combination of oil-and water-soluble flavour systems and pulp to juice products to achieve variety in taste, mouthfeel and appearance. Natural flavouring materials are those derived from acceptable vegetable or animal material by means of physical, enzymatic or microbiological extraction processes. Nature-identical flavouring materials are chemically identical to substances found naturally in acceptable vegetable or animal material. They are made by chemical synthesis or separated by chemical methods. Artificial flavouring materials are not nature-identical materials but are obtained by means of chemical synthesis. For example, a particular synthesized compound may have an orange-like taste but cannot be found in the orange fruit. A number of volatile flavour types derived from different sources can be found on the market (see fact box). Volatile flavours added to orange juice must be natural flavour components derived solely from oranges. Orange flavour is the most delicate and complex of the major citrus flavours. So far, more than 200 volatile compounds have been determined in orange juice, though not all are believed to contribute significantly to the orange flavour. Volatile orange flavours are found in two parts of the fruit, the peel and the juice. Liquids containing volatile flavours derived from oranges are divided into the three main fractions given below depending on their origin and characteristics (see Figure 8.1). Peel oil originates from oil sacs or glands within the peel. It is recovered from the oil-water emulsion resulting from the extraction process (see subsection 5.8). The oil is clear and dark yellow, and contains mainly water-insoluble hydrocarbons. Peel oil is responsible for much of the characteristic flavour of the final juice product. Peely, heavy and green juice notes are its main sensory attributes. The recommended maximum amount of peel oil in orange juice reconstituted from concentrate is about 0.02%. At higher levels, the oil tends to impart a harshness and burning taste to the juice. During the concentration process in the juice evaporator, a portion of the saturated vapour is captured from the juice. This stream, containing volatile aromas and essential oils, is sent to a still mounted on the evaporator in which the important volatiles are separated from the water by distillation under vacuum and condensation by chilling. The product essence is a concentrated mixture of aqueous and oil-soluble aroma compounds. This essence is separated into oil and aqueous phases by either decantation or centrifugation. The essence oil is clear and pale yellow. This phase contains juice oil originating in the juice plus peel oil entering juice during extraction. It contributes a floral fruity, sweet and green flavour. Essence aroma is the water phase recovered from the evaporator. It is clear and colourless and contains water-soluble compounds originating from the juice. It contributes a fruity, fresh aroma and a light citrus taste. Because the volatile compounds that make up the aroma hydrolyze and gradually lose their flavour, aroma is usually stored apart from concentrate. Only natural flavouring components from oranges may be added to orange juice. Orange juice intended for NFC products often contains an excess of peel oil. This oil can be recovered by centrifugation, by flashing the juice in a vacuum chamber or by steam distillation. The by-product oils recovered this way are called deoiler oils. The oil yield from peel oil production can be increased by passing the underflow (water phase) from the centrifuges used for separating oil through a steam stripper. Oils recovered in this way are called distilled oils. Solubility in water or oil, which depends on the structure and the size of the molecule. Boiling point, which determines how volatile the flavour is. For the basic structure of different groups of volatiles see the fact box in subsection 9.4.1. Peel oil consists of over 90% d-limonene, a water-in-soluble hydrocarbon. While d-limonene does not contribute significantly to flavour, it can have a role as a carrier of other molecules. The aldehyde compounds in the oil are the most important contributors to its flavour even though they are present in very low concentrations. 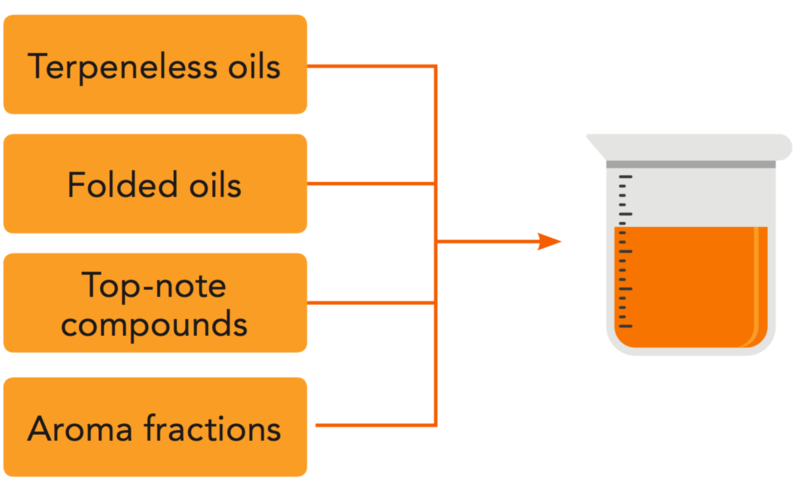 Peel oil can be folded, which means that its hydrocarbon content is reduced (see following subsection) to increase the proportion of desired flavouring substances such as aldehydes and esters. These compounds provide the lighter peel flavour notes. Table 8.1 shows some of the major components of orange peel oil and Table 8.2 presents the d-limonene content of some folded oils. Essence oil is used directly as a flavour fraction or is blended with peel oil to provide the peel oil with the lighter juice-like flavour notes it naturally lacks. Essence oil is also used as a raw material for distilling out specific top-note compounds (mainly esters and aldehydes) that are added to natural orange aroma. The resulting enriched aroma solutions possess sought-after flavour properties and can be tailored to mimic freshly squeezed orange juice, for example, and thus meet specific consumer needs. Essence oil generally contributes the highest level of fruity juice notes when added back to orange juice. Essence oil comprises a mixture of compounds found in peel oil and essence aroma. Over 90% is d-limonene as in peel oil, but the contribution from aldehydes, esters and alcohols is also significant. The most important compound is ethyl butyrate. In fact, the price of essence oil is set by its ethyl butyrate content. The major composition of essence oil is given in Table 8.1. Aqueous orange essence aroma, sometimes called natural orange aroma or water phase essence, is usually collected to contain approximately 13% ethanol as its major organic component. 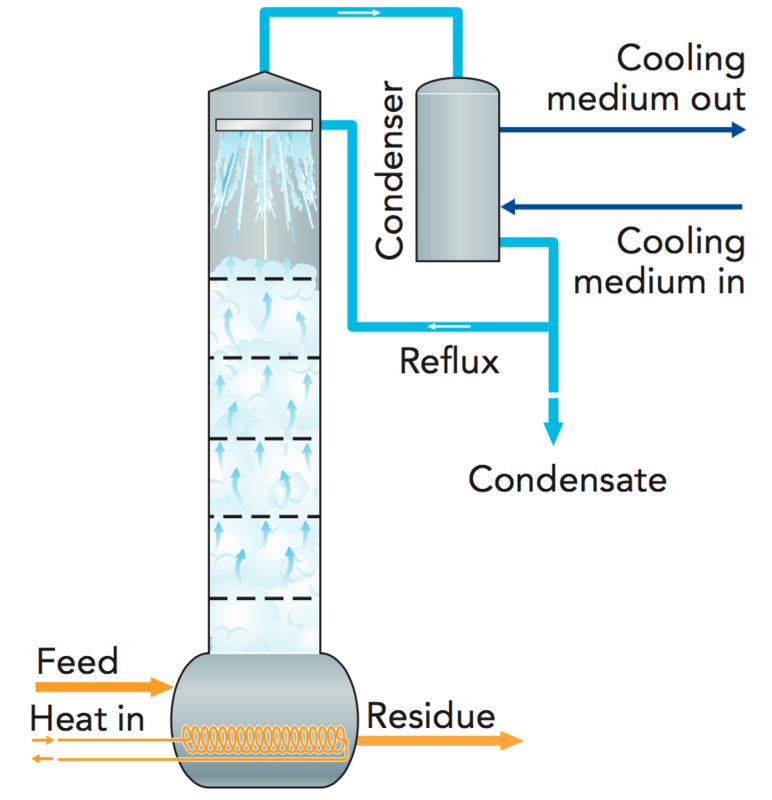 The ethanol content is used as a process control monitoring technique for operating the evaporator essence recovery still. Aroma comprises a complex mixture of aldehydes, esters, ketones and alcohols. Aldehydes are the most important group of compounds, with acetaldehyde having the highest concentration. The aldehydes found in this fraction are highly volatile and contribute significantly to juice fragrance. These compounds are often referred to as the orange top-notes. The major components of orange essence aroma are listed in Table 8.1. Raw flavour materials vary greatly in composition. This is due primarily to fruit variety, different extraction methods, the type of recovery equipment used, seasonal variations of orange fruit properties, and flavour storage conditions. If raw flavour materials are used directly, juice product quality will be inconsistent, which is unacceptable to both the juice packer and juice consumers. Standardization and folding of flavour fractions are achieved by such methods as blending, distillation and extraction. It can be achieved by blending raw materials from different times of the season and/or from different orange varieties. A more sophisticated standardization method is to adjust the content of certain compounds to a standard level by adding single compounds separated from a fraction by distillation. Peel oil and essence oil both contain about 2-2.5% flavour compounds (called oxygenated compounds), the remainder of the oils being mainly hydrocarbons. Separating the oxygenated compounds from hydrocarbons leads to enhanced oxidative stability and water solubility of oils. An oil that is reduced in volume by removal of hydrocarbons or, to be fully correct, terpenes (the main group of hydrocarbons in orange oils) is said to be “folded” by the ratio of volume reduction. For example, a 5-fold oil has had its volume reduced by 80% (in other words, 100 ml of single-strength oil will give 20 ml of 5-fold oil). Folded oils have increased fragrance and lighter peel notes because the folding process removes the harsh “burn” taste of terpenes. Although some top-and body-notes disappear during folding, the latest processing technology minimizes this loss. Raw peel oil and essence oil are referred to as single-fold oil. In this form they are difficult to blend into single-strength orange juice because single-fold oils are not water-soluble. Moreover, the terpenes in single-fold oils undergo acid hydrolysis and oxidation to produce unwanted off-flavours in foods and beverages. 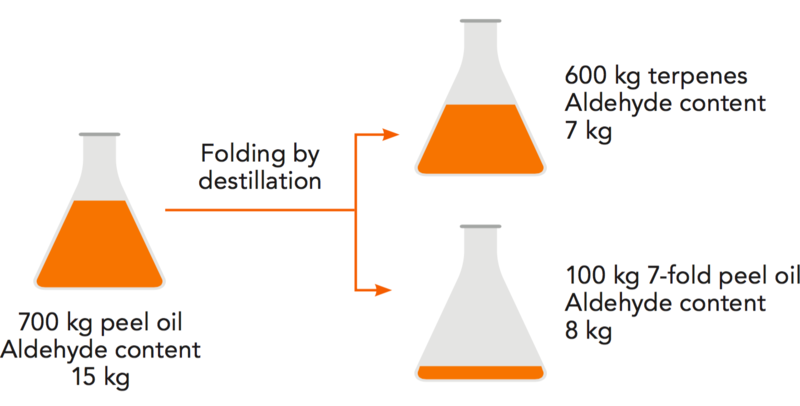 Folding increases water solubility and stability (including shelf-life stability) of oils by reducing terpene content. Folded oils are not used as sole flavour components, but as part of a flavour package. Figure 8.2 outlines the theoretical concentration effect of 7-fold peel oil. However, in reality, over 20% of the aldehydes may not be recovered in the folding process due to losses into the terpenes during distillation (Braddock, 1999). When oils have been folded 20 times or more, they are called terpeneless oils as most of the d-limonene has been removed. As they are highly concentrated, they possess good stability and superior water solubility. Terpeneless oils thus find wide application as modifiers with single-folded oils, blended oils and citrus flavour fractions. Separation of flavour components can be achieved by either distillation or solvent extraction. The principle of distillation is that substances with lower boiling points will evaporate earlier and faster than substances in the mixture with higher boiling points. Peel oil is distilled by heating it under vacuum to evaporate the oxygenated compounds while leaving the higher boiling point components in solution. This achieves separation. However, distillation cannot fully separate the two groups of compounds and a small residue of oxygenated molecules is always found in the distillate, thus lowering the aldehyde content of the pot residue or folded oil. Distillation is widely used to produce 5-to 10-fold oils. Distillation is normally carried out under reduced pressure to lower boiling temperature, thereby minimizing unwanted chemical changes. The principle of distillation is shown in Figure 8.3. In the solvent extraction process, flavour compounds are separated from the hydrocarbons based on their solubility and polarity. The orange oil is mixed with an aqueous solution of alcohol. When thoroughly mixed, the polar flavour compounds move from the oil into the solvent. The polar flavours are recovered from the alcohol by removing the solvent using low-temperature distillation. The principle of solvent extraction is shown in Figure 8.4. The principle of solvent extraction. 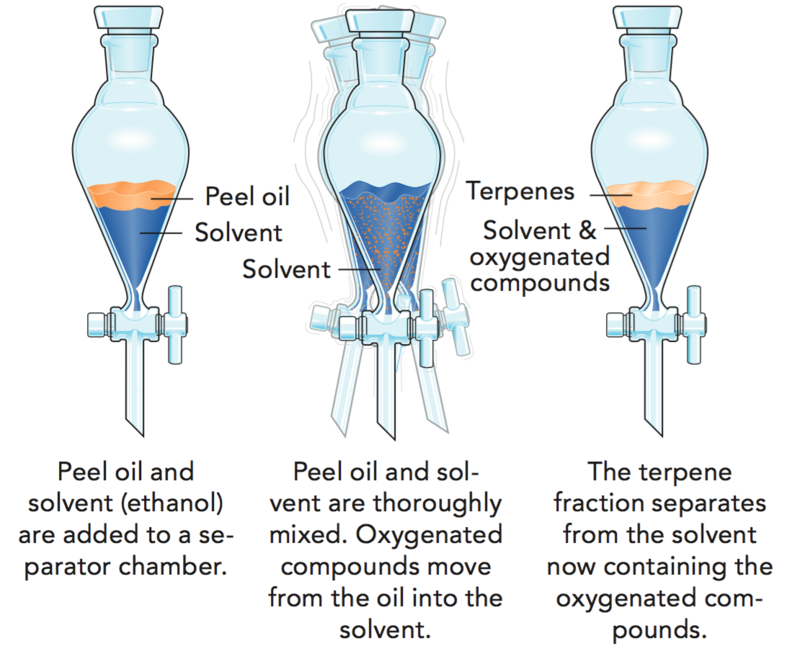 Solvent extraction almost completely separates terpenes from the desired flavour compounds and can therefore be used to produce highly folded oils in the 40-to 60-fold range. The main objective in creating a flavour system is to supply the juice packer with an easy way to optimize and diversify taste profiles in its product portfolio. A flavour system can be designed to give a unique flavour to a juice and is often the result of joint development between the flavour company and the juice packer. Blended oils are a simple form of flavour system containing a mixture of peel oils, essence oils and certain other oil fractions. A more sophisticated flavour system can be based on terpeneless oils with addition of essence aroma and enhanced with top-note compounds such as acetaldehydes and ethyl butyrate. The basic components used to create a flavour system are shown in Figure 8.5. Flavour systems represent an easy tool for juice packers to standardize the quality of their products and to obtain an optimized flavour for particular juice products, for example orange juice for chilled storage or storage at ambient temperature, or for juice intended for specific European and Asian markets. Premium pulp production has become more important because adding pulp to juice products is thought by many people to give a fresher appearance and better mouthfeel to juice. Pulp can also add value to products because many consumers are prepared to pay more for a juice containing pulp. Floating pulp consists of the larger solid particles in juice – mainly ruptured cell sacs and segment walls. It is separated from the juice in finishers. Pulp contains mostly carbohydrates, pectin and crude fibres. The crude fibres are made up of hemicellulose and cellulose polysaccharides and give stability to the tissue forming individual juice sacs. For many years orange pulp was a by-product of little value used for the production of pulp wash or cattle feed. This has changed in recent years. Today, more pulp is processed for sale as floating pulp for addition to juice. Section 5 describes the different ways pulp is processed. This section deals with the quality and characteristics of the commercial pulp product sold for addition to orange juice. In talking about orange pulp, it is of great help to know the correct meaning of terms commonly used to describe raw materials and products. Pulp, juice sacs, juice cells and fibres are all terms used to describe the same thing. Adding to the confusion is the fact that many terms have different meanings when used in fruit processing and with reference to the end product at the juice packers. The by-product stream at different process steps within the plant and also the product sold commercially. The pulp stream leaving the final finisher with a very high concentration of solid particles. This is the product sold as “frozen pulp”. Used in Florida for the pulp stream to the pulp pasteurizer and to the aseptic bag-in-box filler. The concentration of solid particles is about 500 g/litre. These are mainly cell walls and segment walls. The cell walls are fragmented during extraction. The length of particles varies from <0.5 mm up to 25 mm. Very small solid particles that flow with the juice through the finisher screens. Solid particles that have been washed with water to remove juice. Used for cattle feed or sold in frozen form after removing most of the water. Sugars and other juice solubles recovered from pulp by washing it with water. Sold as 65 °Brix concentrate in frozen form. Sometimes added to orange juice before evaporation. A confusing term which means the amount of solid particles in the pulp stream. Methods to measure pulp concentration vary. Finished pulp sold in frozen form. Pulp sold in aseptic bag-in-box containers. Contains considerably more juice than frozen pulp. Used by some people to mean “sinking pulp” and by others to mean “floating pulp”. Very small solid particles (<0.5 mm) that settle from the juice with time (or spin down in a centrifuge). Sinking pulp is part of all citrus juices, even those without added floating pulp. Larger solid particles. Most float to the top after juice is stirred. Used mainly in Florida for floating pulp. Sometimes used to mean large solid particles. Frozen or aseptic pulp added to juice. Intact citrus cells that still contain juice. These liquid-filled cells cannot be obtained by normal extraction methods. A product often sold canned in syrup and added to juice drinks. The proportion of added cells that float to the top when added to juice. Unless otherwise stated, in this text the expression “pulp” refers to the product sold commercially or the by-product stream at the fruit processor. The two main types of orange pulp on the market originate from squeezer-type and reamer-type extractors. The two extraction methods produce pulp with somewhat different properties and therefore affect pulp quality. Pulp from reamer-type extractors has longer cells and lower oil levels than pulp produced in standard squeezer-type extractors. Due to the increased demand for high-quality pulp, some plants have extractors adjusted to optimize pulp quality rather than to maximize juice yield. The properties of floating pulp are not very well defined in the juice industry or by juice packers. However, some properties are more important than others. These are discussed below. See also Table 8.3. Generally, pulp with longer and less damaged cells has better floatability and provides a mouthfeel closer to fresh juice. 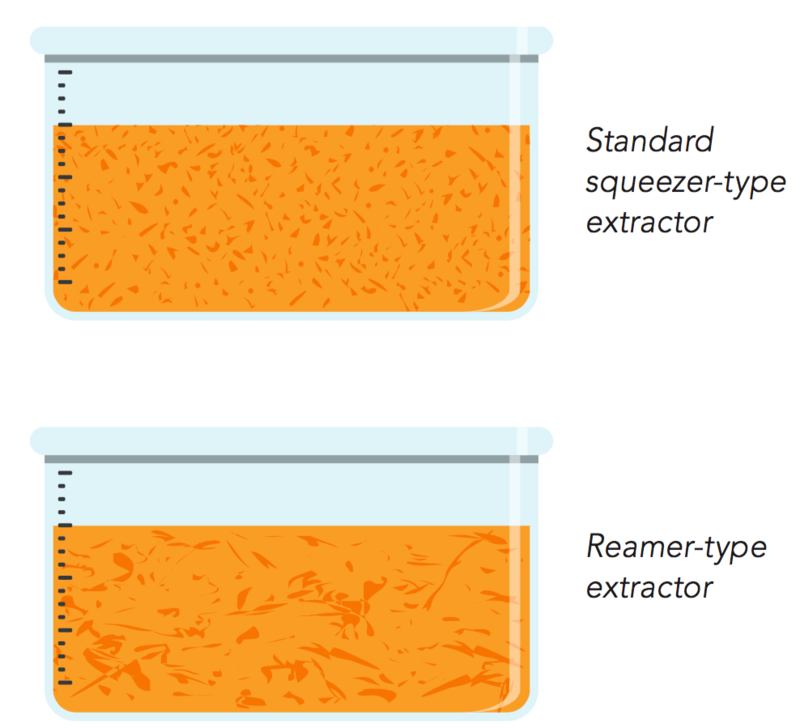 A reamer-type extractor produces a pulp with longer fibres and less fragmented cells compared with pulp from a standard squeezer-type extractor. Pulp from reamer-type extractors can contain fibres up to 25 mm long. 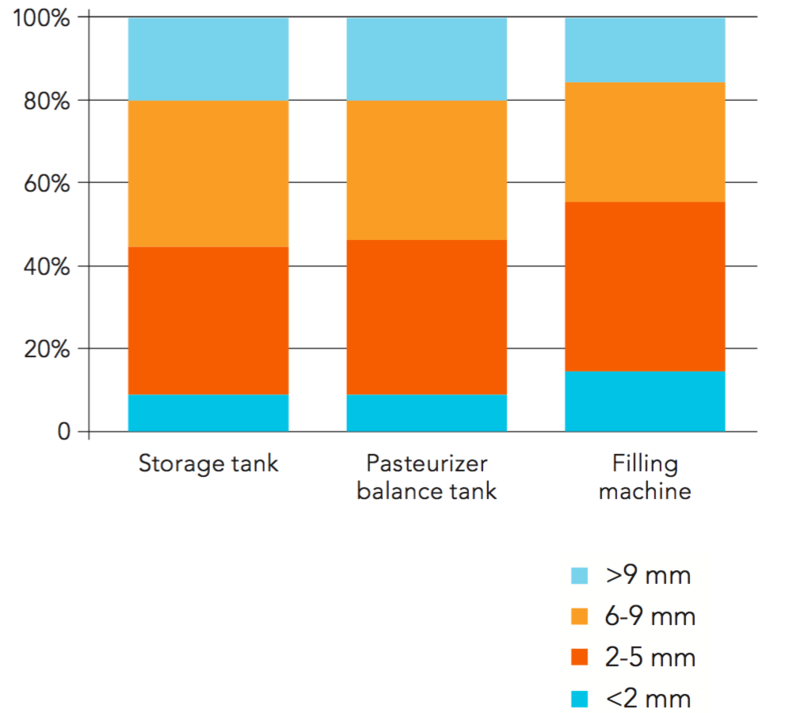 In pulp from a standard squeezer-type extractor, most cells are shorter than 5 mm and about 40% are shorter than 1 mm. However, a new system of squeeze extraction that yields longer cells has been introduced. Figure 8.6 illustrates the visual difference between pulp from the two extractor types. The concentration of oil is an important quality parameter when adding floating pulp to juice. This is because the oil level in the pulp stream is often higher than in the corresponding juice stream. Oil droplets and cell membranes that are hydrophobic (do not mix easily with water) are naturally attracted to each other, particularly when present together in a hydrophilic (easy mixing with water) juice environment. An excessive oil content in the final juice gives it a harsh and burning taste. A reamer-type extractor normally gives an oil content of 0.03–0.06% v/v, whereas pulp from a squeezer-type extractor may contain oil levels from 0.05% v/v upwards. To minimize the oil content from squeezer-type extractors, so-called low-oil extractors can be used. The contribution from both the floating pulp and the juice must be taken into account when calculating the total oil content of the final product. Apart from cell length and oil levels, quality parameters such as taste, colour, °Brix, ratio and microbial status are also important. The °Brix and ratio levels strongly depend on what orange variety the floating pulp comes from, but they should be similar as for orange juice. Flavour and colour are often specified as “typical”. It is important to know the floating pulp concentration both at the juice processor and at the packer. Several different methods exist for analyzing pulp concentration, depending on whether it is a pulpy juice stream, finished pulp or final single-strength juice. The pulp stream or final juice can be analyzed by pouring it onto a screen with defined hole size. Excess juice is drained from the screen, with or without shaking, and the screen plus pulp is weighed. The result is expressed as grams pulp per litre (or quart) juice. Alternatively, juice is poured into a glass beaker to see how much settles and how much floats after a certain time. A method used by many processors in Florida and Brazil involves screens and a shaker that rattles the screens at a defined frequency and amplitude. This is an attempt to standardize the screening method. Screens with different mesh numbers are used to analyze floating pulp content in the laboratories of juice plants. In Florida, the 20-mesh screen is the norm, whereas some Brazilian producers use a 40-mesh screen. Screen hole size can have a significant effect on analysis results. When smaller screen holes are used, the pulp releases more water during analysis. Therefore, exactly the same method must be used if measurements are to be compared. Dynamic image analysis is a modern method to characterize not only size distribution but also particle shape of pulp. The product is dispersed in water and run through an image analyzer cell. Figure 8.7 shows an example of output information. It presents the relative pulp sizes in orange juice at different processing steps at the juice packer. A special method called Quick Fibre (QF) is used to analyse commercial pulp (finished pulp) leaving the producer. It determines the dryness of finished pulp and this method also uses a FMC shaker and a screen. The dryness of the pulp is set in the finishers and is an important process parameter because it determines not only the juice yield but also the quality of both juice and pulp. Quick Fibre is an analysis method used to determine the “dryness” of finished pulp. 200 g of pulp is mixed with 200 ml of water and stirred for 1 minute, left alone for 3 minutes and then stirred again for 1 min- ute. Thereafter, the mixture is screened and shaken for 3 minutes. QF value is the weight of the liquid (in grams) drained from the screen. A high QF means that the pulp analyzed has high juice content. A low QF indicates that the finished pulp analyzed is dry and has absorbed some of the added water. The QF method is mainly used during fruit process- ing to determine the correct finisher settings. Typical classifications of QF values are listed below. Overall juice quality is determined at the fruit processor by the choice of raw material (orange quality and variety) and extraction methods. Further processing cannot increase juice quality. On the contrary, during some processing steps, such as evaporation, the juice loses most of its original freshness and aroma. To provide the desired flavour characteristics in reconstituted juice, volatile flavours and floating pulp can be added back at different steps of orange juice processing and packaging (see Figure 8.8). At the fruit processor, peel oil is often added to concentrate before frozen bulk storage in tanks. It is believed that the oil-soluble volatile components help to mask any processing off-flavours present in orange juice reconstituted from concentrate. A typical concentration of added peel oil in juice concentrate before storage is 0.008% v/v. This low level still allows addition of a flavour package to the juice for reconstitution at single-strength concentration at which it is consumed. Blending houses supply juice packers with concentrates of consistent quality. As well as mixing concentrates of different origin, blending houses will add flavours – an important element in achieving product uniformity. 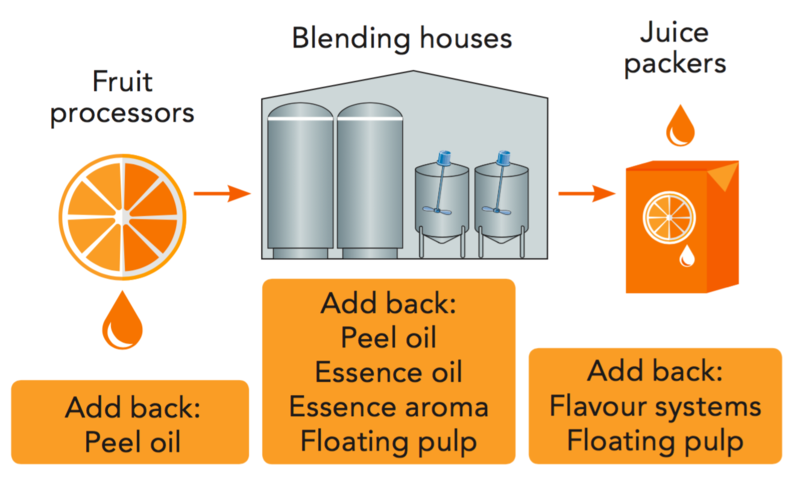 By altering the amounts and types of volatile flavours added, blending houses can produce orange concentrates with different characteristics. Floating pulp is added to improve the mouthfeel of juices and give a fresher appearance. The blending house can add the pulp directly to the concentrate. The juice packer can modify the taste of orange juice by adding selected volatile flavours before finished product packaging. Oils are difficult to mix homogeneously with single-strength orange juice and must therefore be added to the juice concentrate before reconstitution. This is usually achieved with a batch premix system. It is possible to disperse a maximum of 2% oil into FCOJ at a minimum 42 °Brix. This should preferably be done under a nitrogen blanket. The premix can be kept overnight under refrigerated conditions ready for production the next day. Before reconstitution, the premix blending time into the concentrate should be not less than 30 minutes to assure an even distribution of flavours in the final product. In general, water-soluble aromas can be added at any time during the reconstitution process. Normally they are added either together with the oils in the premix or later in the reconstitution phase. Water-soluble aromas contain the most volatile flavour components and should be added as late as possible in the process. A flavour system based on terpeneless oils provides the juice packer with a tool to optimize juice taste with a single addition of flavours. Since terpeneless oils are much more water-soluble they can be added to single-strength juice. In this context, it should be noted that the addition of flavours is not the single route to good juice taste. A sophisticated and well-balanced flavour system can enhance juice flavour but can never fully mask the off- flavours from a badly produced concentrate. When pulp is added back to the juice at the juice packer, it must first be crushed or thawed before being added back to the blending tank. Pulp packed in 20 kg boxes can be left at ambient temperature for a few days to thaw or the blocks of pulp can be sliced into smaller pieces and thawed in water. Nevertheless, both methods are very labour-intensive. When using pulp in 200 litre drums, crushers similar to the ones used to thaw frozen NFC are needed because the time required to thaw a drum is long enough to cause microbial problems. The labour-intensive part of pulp thawing can be avoided by using aseptic pulp. However, there are only a limited number of aseptic pulp suppliers on the market. The pulp is added to the concentrate in the reconstitution tank before dilution. Constant low-speed agitation of the tank is necessary to obtain an even distribution of cells. Moreover, it is very important to prevent too much air from entering the juice during tank agitation (see subsection 4.2).